Wat or wet, known as tsebhi in Tigrinya, is an Eritrean and Ethiopian stew which may be prepared with chicken, beef, lamb, a variety of vegetables, and spice mixtures such as berbere and niter kibbeh, a seasoned clarified butter. Left: Alicha stew, typical cusine from Eritrea. Several properties distinguish wats from stews of other cultures. Perhaps the most obvious is an unusual cooking technique: the preparation of a wat begins with chopped onions cooked in a dry skillet or pot until much of their moisture has been driven away. Fat (usually niter kibbeh) is then added, often in quantities that might seem excessive by modern Western standards, and the onions and other aromatics are sautéed before the addition of other ingredients. This method causes the onions to break down and thicken the stew. Stews include zigni, which is made of beef, dorho tsebhi which is made of chicken, alicha which is made without berbere, and shiro, a puree of various legumes. 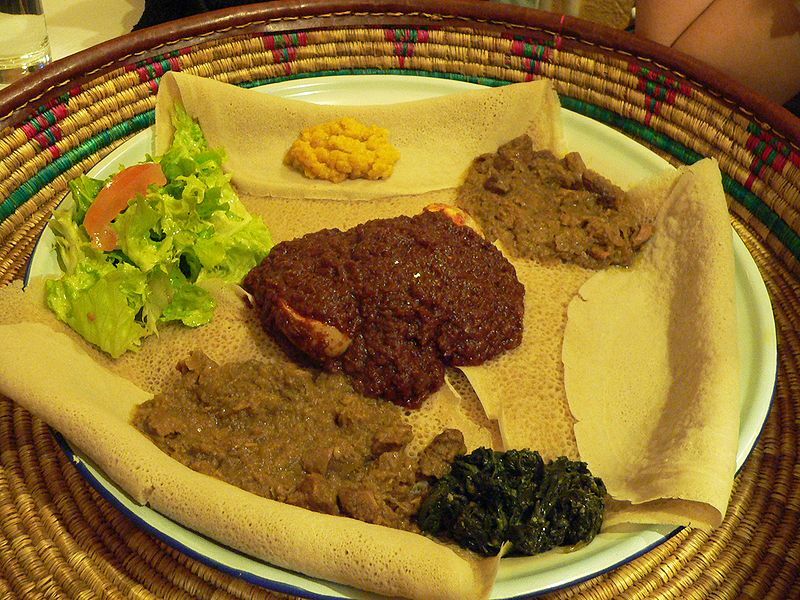 Wats are traditionally eaten with injera, a spongy flat bread made from the millet-like grain known as teff. They are also served with hilbet (paste made from legumes, mainly lentil, faba beans). When eating, diners generally share food from a large tray placed in the centre of a low dining table. Numerous injera are layered on this tray and topped with various spicy stews. 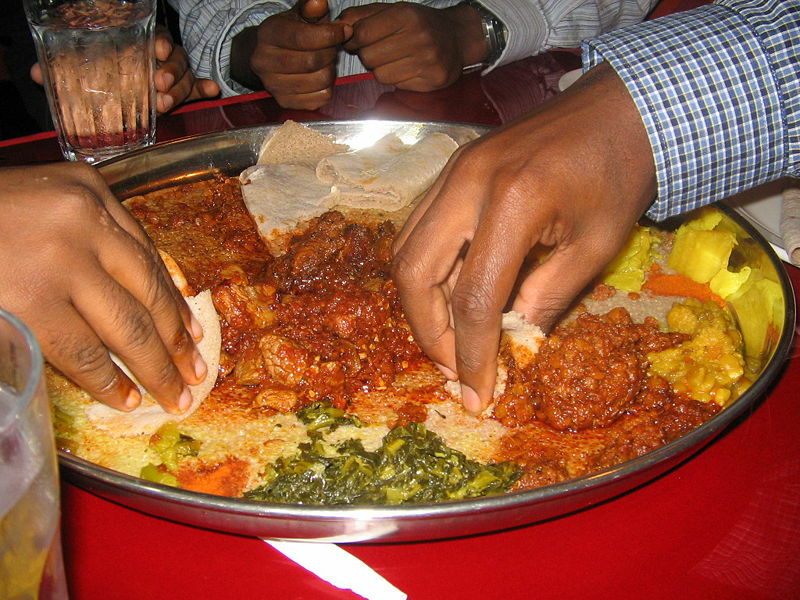 Diners break into the section of injera in front of them, tearing off pieces and dipping them into the stews. Left: Ethiopian meal shared as part of a group.